A gruff ugly bloke punching way above his weight murders his blonde girlfriend in an abandoned insane asylum after they both drop acid. He claims a devil chair did it and gets stuck in a functioning asylum. A few years later a dim professor comes along and takes him back to the scene of his crime for "therapy". A bunch of students come along as extra fodder. 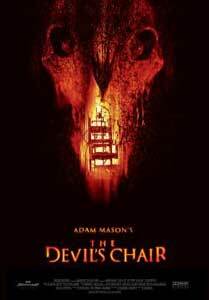 So is there really a devil chair or is he just a psycho? This is quite stylishly done and it feels a bit different in the beginning, the trouble is all the characters are detestable except for the comic relief provided by Matt Berry. The plot is also contrived in the extreme and falls apart completely towards the end. The director even goes on an ill-advised rant at the audience through some awkward direct narration from his lead character. It's trying a bit too hard and it fails.